I’m pretty excited about the Tesla Powerwall, the home battery that was announced recently. People mostly think about home batteries as being important for solar. For residential solar, most of your generation is during the day when you aren’t home, so it gets sold back into the grid and therefore relies on the whatever the buy back rate set by your retailer is. These rates are lower than the retail price of electricity so the real benefit is if you can store the “free” electricity you generate in a battery and then use it during peak hours instead of paying for electricity, thus avoiding your variable electricity charge of 20-30 c/kwh. So the economics of solar depend on whether your savings (avoided retail prices + electricity sold back into the grid) justify the cost of installing solar panels and a battery (typically well over 10k, but costs are falling). But if you don’t have solar, home batteries could have another use: storing cheaper power generated during off-peak and using it during peak when prices are high. This of course only works if you have variable electricity pricing, which isn’t super common in New Zealand. But if you are have day/night rates, or are on Flick Electric like me, then you might be able to exploit the difference between peak and off-peak prices and save some money. 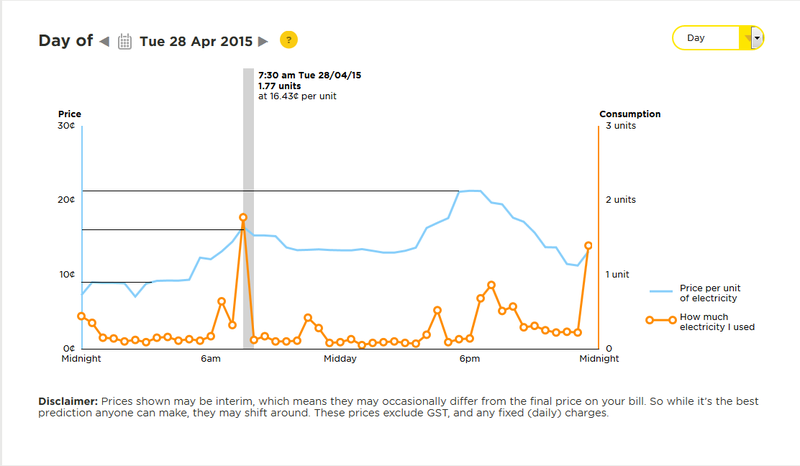 See, for example, the below graph of my electricity use and prices from last Tuesday. I have drawn some lines indicating the “overnight price”, the “morning peak” and the “evening peak”. Note that I didn’t use a lot of power that evening (we usually do so this is non-representative), but did use a fair amount in the morning, which is unavoidable. I also ran my dishwasher on delay that night to take advantage of lower prices later in the evening. If I could store power at the “overnight rate” of 10 c/kwh, there are times when I could halve my variable cost of electricity (i.e. those times during peak when I can’t change my behavior). what the price is at those times. Hopefully someone does proper modelling of it, or maybe Flick will team up with Vector who have a “special” relationship with Tesla. You could get some pretty complicated/cool software if you integrated this type of logic with Solar. I.e. buying power over night when the forecast is for rain the next day.